Fast forward a decade or so. ‘I want these files cleared by Tuesday. That’s your goal. Anything less and you can kiss your bonus good bye’, said my boss. Not really a rockstar’s life, right? And so we come to the difference between aim and goal. A goal is a target or a desired result. The aim is the process of orienting yourself and your actions towards a goal or an ambition. An aim is like a relatively long term plan of action. When you aim, you try to see the bigger picture. The goal is the final point or level to reach at, and doing so in a sense brings closure to the aim that you had some time ago. Often, goals form subsets of the aim itself. Let’s say you’re fascinated by hybrid cars and want to come up with one yourself. Your aim then becomes to get to see your ideas up and running on the roads. How do you go about it? You set yourself small goals, carefully thought out to achieve the said aim. These goals can be designing the engine, selecting the fuel, designing the car itself and so on. Each and every component once completed forms the whole, and the job is done. Goals can thus form stepping stones which then come together to make up a stairway that finally leads to the aim. lanceaksh. "Difference Between Aim and Goal." DifferenceBetween.net. 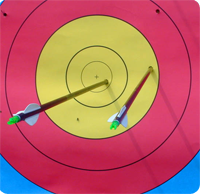 August 15, 2009 < http://www.differencebetween.net/language/difference-between-aim-and-goal/ >. My team desires to become the champion of a football ⚽️ championship. Thereby we went making GOALs in every match from round 1⛹️ to Qfinal and then Cfinal too. In Final I scored the leading GOAL but it didn’t last long after 5 minutes there was an equalizer⚖️. In penalty shootouts I missed the last GOAL. Our dream came to an end. Now what was our AIM ?